Pokemon GO has now been out for two months. 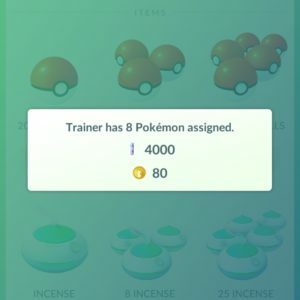 There has been a lot of changes in the past couple months, we have seen a drop in users, the buddy system recently added and nest changes as well! This past month has been pretty crazy and really eventful so the game has been a nice break from everything going on. I have been hanging out with friends and we have had some great conversations and even got some thoughts on my Youtube channel and some thing that I want to do in the future with Cosmic Rage. The game has been great to get out and talk creatively with some people and gather their thoughts and hear another perspective. More on this coming after the move! 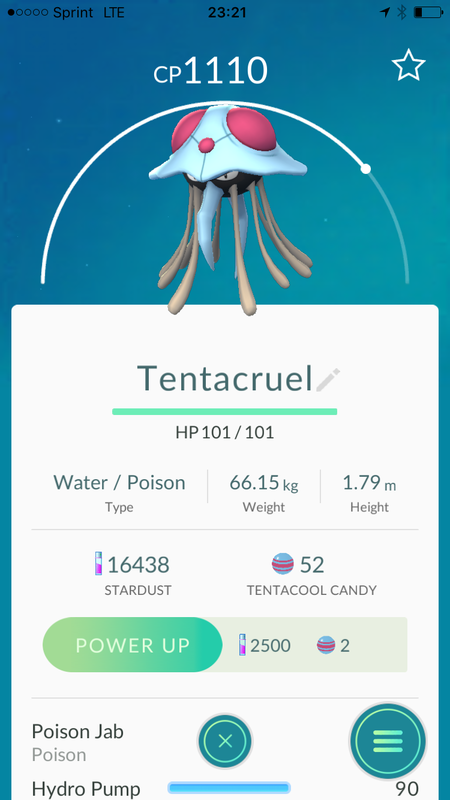 My pokedex is currently at 108. 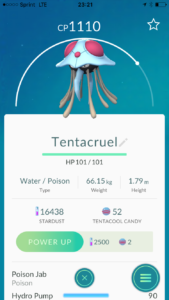 Here are a few of my more notable catches and evolutions over the last month. 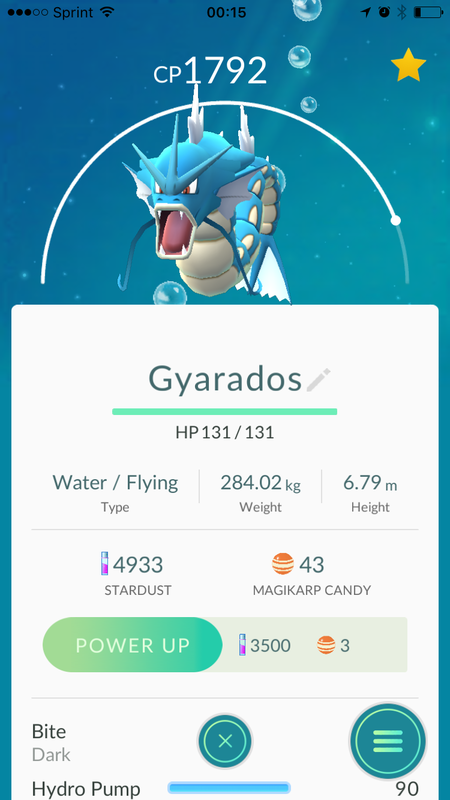 I finally captured enough Magikarps to evolve into my Gyarados. I also hatched another Rhyhorn so I finally could get my Rhydon as well. 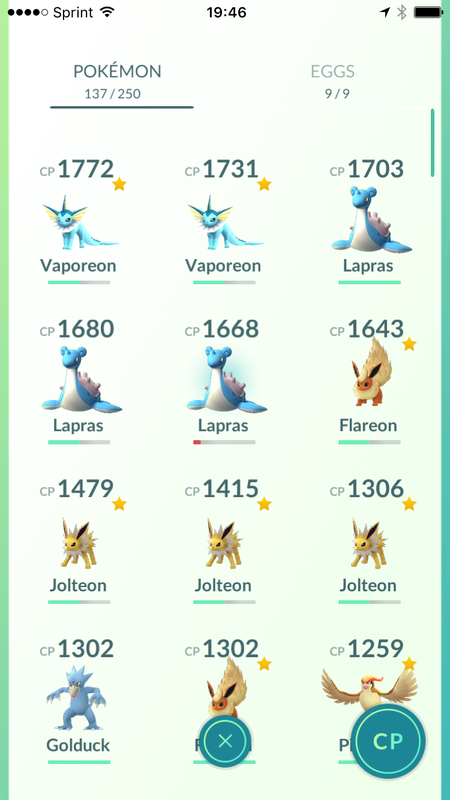 I have a lot of mid-tier Pokemon that I need a few more candies to evolve and some that I am holding out for a higher appraised Pokemon to evolve. 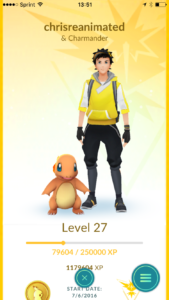 For the buddy system, I am rolling out with Charmander. 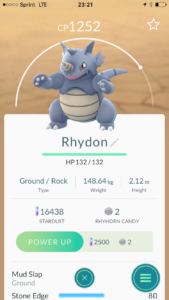 I haven’t caught one and I think I have only hatched 2, so I need to start farming candies for him so I can get to Charizard! It is pretty surprising how the gyms scene is playing out around here. There are definitely starting to be areas that are forming and of course the contested areas that are always under siege. 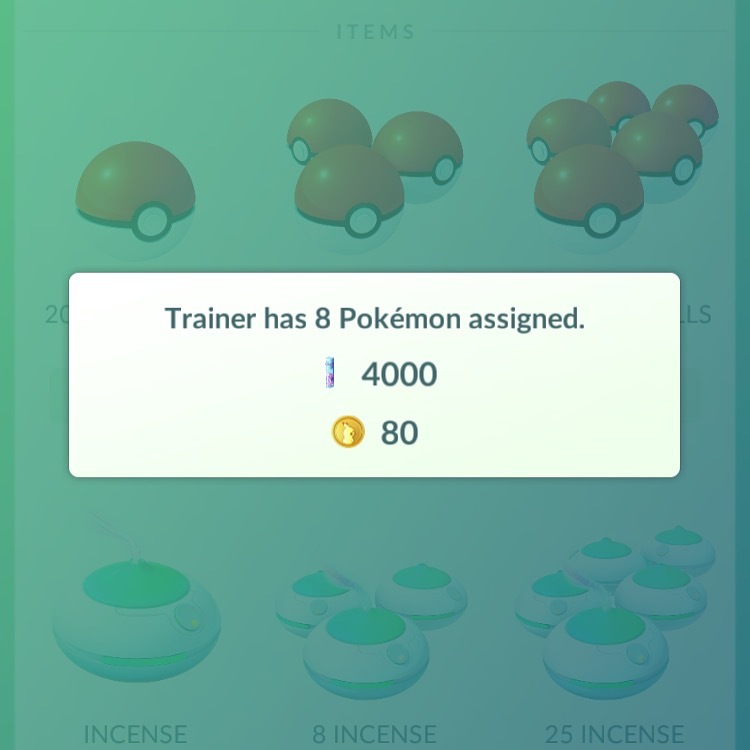 I did have my best day collecting coins on the game front last weekend where I was able to claim 8 in a morning gym run. Overall I am now at level 27 and counting! It’s a Friday evening. There are two young kid hunkered down in a dark basement with nothing but the glow of a worm light and a dim lamp next to them. The lamp casts a soft glow on a Nintendo walk-through magazine. The two kids are having a conversation about how cool it would be if this game was real. Of course, that game was Pokemon and this was my early teenage years. Pokemon GO isn’t real life, obviously the Pokemon only exist on your phone. But as of now, this is the closest thing we get to actually existing in that world. I’m not going to get into the actual game because you know all about it at this point and if you play the game, you are aware of the issues with the tracker, the servers and what not. Instead, I want to talk about how in one month, this game has changed my life. The last year has been pretty intense. Finishing up the first episode of Cosmic Rage, going back to school, getting engaged, freelance work but I live by the motto “Work hard, Play hard”. With several of these things wrapping up, I decided to really dive into the game. Clearly the game has gotten me out walking, which I enjoyed doing before but the game really kind of prompts me to do it instead of talking about it. Hiking was always something I did after my work was done but given the above list, it was never done, so my hiking trips always got pushed to “next weekend”. I knew I wasn’t getting there, but I told myself that. With some of the server issues, I found myself playing more at morning and night with only a couple minor walks throughout the day. Mostly a mid morning jaunt around the neighborhood or maybe a few steps over lunch to hatch some eggs. So let’s start with mornings. I’ve never been much of a morning person. I would snooze my alarm clock until the last minute, grab a red bull on my way out the door and be off to work. Now I find myself leaving for work a half hour early so I can get down by the river and start plugging away on catching Magikarps. I mentioned the quick walks during the work day, mid morning and sometimes over lunch. These provide me with nice breaks to get away from the computer and get some fresh air, exercise and some steps toward hatching my eggs. It also is a nice way to step away from a project and switch gears for a bit. Plus it is great to have something non-work related to discuss in the office in the morning. Most importantly though, I’ve been playing at night too. It is an absolute blast exploring the downtown scene at night and seeing all of the other players. 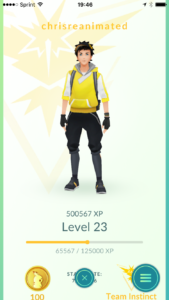 I’ve met some cool people and have helped take gyms down, Team Instinct for life! So this all sounds great right? But I wanted to share some of the pros or cons from this so far. In the last month, I have logged about 75 miles of walking or 121 kilometers from the game. I have caught almost 1500 Pokemon. Besides this though, I have become more of a morning person. I get up earlier and more importantly, I use the game as an excuse to exercise more, where before I was treating exercise as more of something I didn’t get too. In this same aspect, I have hung out with more of my friends, all of whom use the game as the same excuse. It feels great to connect with them after being away for so long working on my various projects. I’ve slimmed down a little bit in the last month too and generally feel a lot better, I no longer loathe mornings. But the biggest benefit of my playing regiment is that I no longer have my regular migraines. I am not sure if it is because I am spending less time in front of the computer or if it is that I am spending less time in front of the computer at night, but either way, it has made me feel more productive and focused. 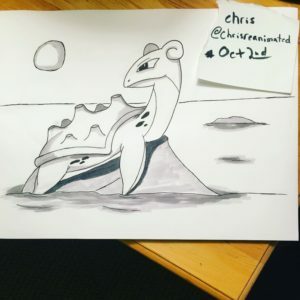 I would love to hear your stories about how Pokemon GO has affected you! Keep at it my fellow trainers!